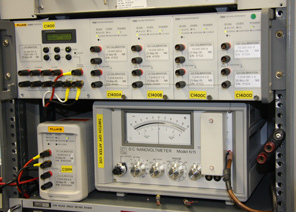 The Absolute Calibration laboratory volt is maintained using a Fluke 7000 Nanoscan DC Reference System incorporating four reference standards and a travelling standard. Calibration uncertainty of zenner references at 10 V is ±0.23 ppm. 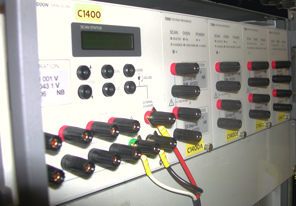 Dissemination of dc voltage up to 1000 V is through precision dividers and 8.5 digit laboratory digital multimeters. Voltages up to 100 kV are measured using specialist resistive dividers designed and built in-house. Current measurement up to 100 A is maintained through precision laboratory DMM's and standard current carrying resistors. For other values, please take the link below to view our full UKAS Calibration schedule.